As many of you know, I’ve spent a considerable amount of time on planes, in airports, in cars, and in hotels the past few years of my life. 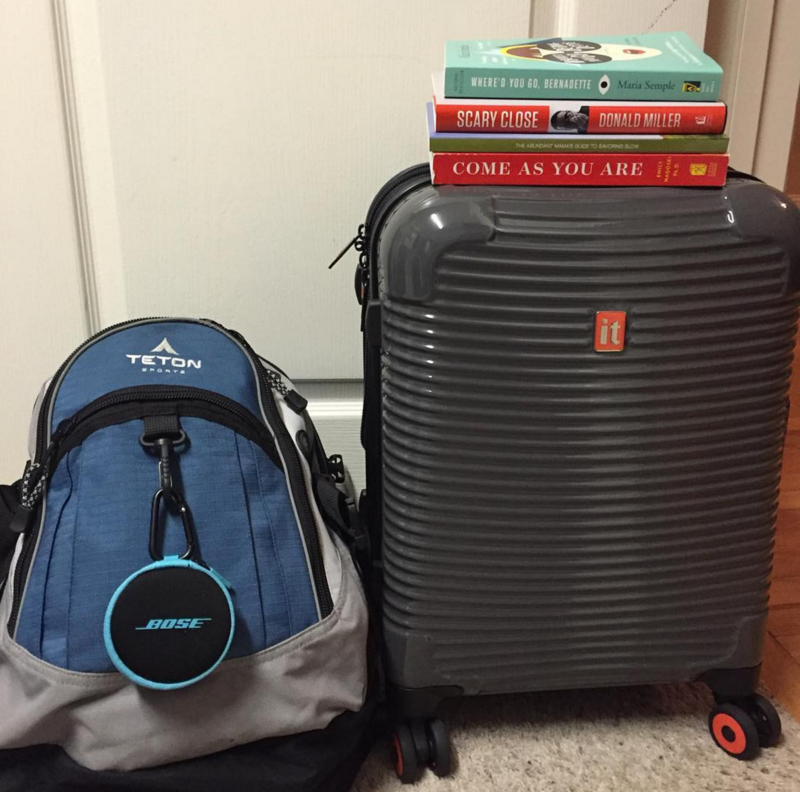 As a result, I’ve gotten pretty good at packing for trips and being prepared for the unexpected… because you just never know what you might need when you’re on the road. These come in handy for so many different things: quickly washing a stain off an outfit, wiping down the airplane seat or tray, washing your hands, wiping up a spill, and so on. I can’t tell you how many times they’ve rescued me or my kids or someone I was traveling with from a sticky situation (see what I did there?). You can get travel packs of Wet Wipes from Target (look in the dollar section) or the dollar store. If I’m going to a speaking event, I always pack a complete extra outfit that I could wear on stage. You never know when something might rip or a something will get spilled or you just will end up needing another option for some reason. Knowing that I have a backup outfit lets me breathe easy and not have to worry when something happens to what I’m wearing. And it’s not just a great idea for speaking events! The other day, the guy next to me on a plane got up from his seat to go to the bathroom and knocked my entire cup of ice cold orange juice all over me. I was SO glad I had an extra pair of pants because otherwise, I would have had to be on two more flights in completely soaked jeans! I’m such a fan of comfortable shoes! Not only are they better for your feet and back, but you will be so grateful for them on days when you need to walk for miles through airports or when you’re at an event that requires you to be on your feet for hours. (see me wearing them in the photo below) are my very favorite shoes for traveling right now. I just adore them! Plus, they slip on and off which is really nice for when you want to slip your shoes off on a long flight plane or car ride. For speaking/dressier events, I love the . They are durable, they offer so many different cute options, and they are comfortable — even when you’re on your feet for hours and hours on end. 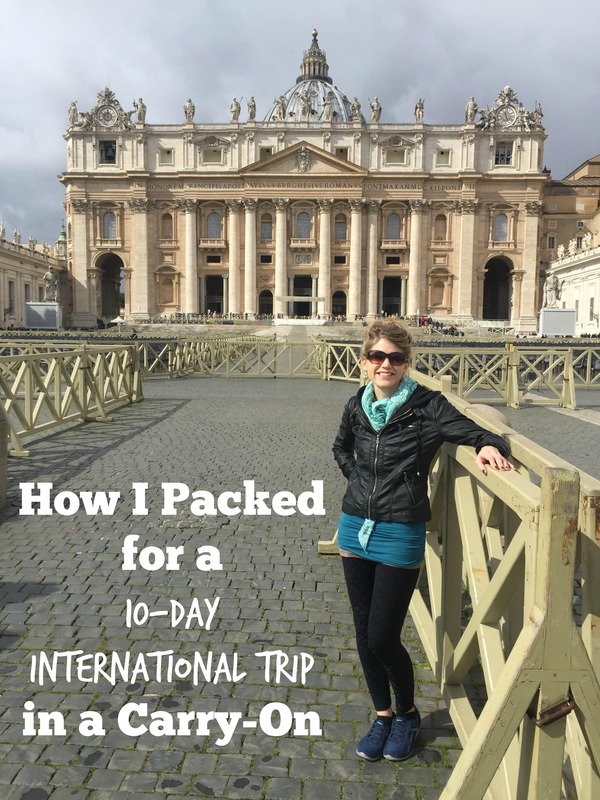 Want to know what I brought on a 10-Day International Trip this year? Find my packing list here. I find that blasting music I love in my ears is so energizing on trips where I’m feeling a lack of energy or confidence. This year, at the encouragement of a friend, I got a pair of . I am hooked! They are far better than any pair of headphones I’ve ever had before. They are comfortable (even when wearing them for long periods of time), they stay in your ears well, and they have such great sound quality. Plus, they really are far more noise-cancelling than any other earbud I’ve ever tried. I use mine for listening to music while working at home, for business phone calls and Zoom meetings, for interviews via Google Hangout, and, of course, while on planes and at the airports. I never, ever travel without bringing at least 1-2 books… sometimes more like 4-6! I just can’t help myself! People always tell me I should use a Kindle, but I’m such a lover of real books that I’m willing to lug around the extra weight in my backpack in order to get to experience the thrill of reading a real book. Flying is one of my favorite opportunities to get in some good reading. Even if I plan to work on my computer during the flight, I always have at least 30 minutes on the take off and touch down to get in some reading. It’s amazing how that can add up to a lot of reading if you fly regularly! Tip: Need some reading inspiration or ideas? Check out my list of my 10 favorite books I read in 2015. These are the best things ever invented for speakers or anyone who spends time on the road! When I’m in a book-signing line or at a meet and greet, the last thing I want is to have bad breath! However, at many events, I can’t easily make it through the crowds of people to brush my teeth in the nearest bathroom. So come to the rescue! They are also nice for when you are feeling grungy from a day of traveling and just need to quickly freshen up. I keep a few packs of these in my purse at all times… and then use them multiple times a day on every single trip! Traveling takes its toll on your body. You not only often get less sleep, but your sleep usually isn’t as good since you’re sleeping in a strange bed in a new place. Plus, add in time zone differences, schedule differences, and exposure to all sorts of germs on flights and in public places and it’s a recipe for getting sick a lot more easily. This is why I always bring extra medicine and essential oils. I usually always bring Advil, Benadryl, and DayQuil/NyQuil + OnGuard, Thieves, and Tummy Rub oils. At the first sign of sickness, I use lots of OnGuard and Thieves and then Tummy Rub oil works amazing if my stomach or digestive system is a little off (as often can happen while traveling). If there’s any possibility that you won’t have ample access to an outlet to recharge your phone, you must invest in an external battery. In fact, if we’re going to be on a long flight or a long trip, we’ll often bring more than one fully charged external battery just to be safe. This way, if an outlet is broken, your layover gets shortened, you can’t find an available outlet, or you just plain don’t have time to plug your phone in amid the crazy of trying to get to your destination, you can pull out your external battery and you don’t have to worry about your phone dying! You can and, in my book, it’s a must-have for anyone who travels! By the way, if you’re going to try to sleep on a plane, having a great pillow can make all the difference. and it’s the only thing that allowed me to get hours of good sleep on international flights. You have to fuss with it a little bit to get it situated just right and I usually prop a blanket up on it to help give me a little extra support, but if you get it just right, it’s SO comfortable. One of the most important things I try to always bring when I travel is patience. I try to go into the day expecting delays, expecting flights to not go as planned, and expecting that there will be unexpected frustrations. This is not because I want to be a Negative Nelly; it’s because I want to be realistic! Delays and interruptions are part of travel. I want to prepare the best I can, but then go into traveling expecting the unexpected. Why? Because then if it happens, I won’t be surprised or frustrated… I planned for it to happen! And if delays and frustrations don’t happen, then I’ll feel like I got the added gift of extra time and a smooth travel day! 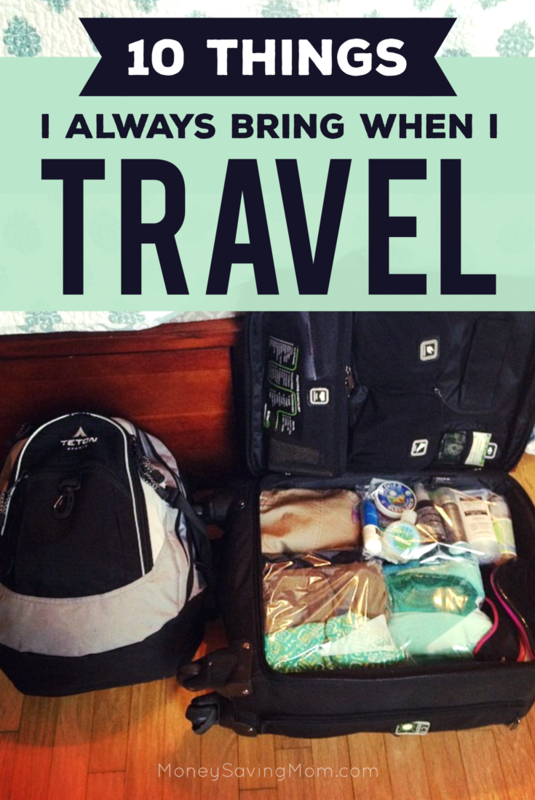 What do are your travel must-haves? What would you add to my list? I’d love to hear! Thanks for this. We’re about to start traveling more often. I know you mentioned that you get motion sickness. I really hate turbulence on planes. How do you overcome this? I also find that if I don’t fly on an empty stomach, it helps. But for longer flights or turbulent flights, Dramamine is the only thing that really works for me. And to not get anxiety while flying… well, the best thing that works for me is to not look out the window or really think about the fact that we’re flying. I bring things that I love to do (reading/music, etc.) and then work on projects that distract me (such as a blog post or a writing post). I always choose an aisle seat (you can pick your seat when you are booking your ticket or through the app on the airline you’re flying on) as I find that helps me feel less claustrophobic. When I’m less claustrophobic, I’m more at ease. Deep breathing also works well if I’m starting to feel really stressed about turbulence. Also, turning the A/C vent right on you and blasting the air on your face. Get comfortable: take your shoes off, wear comfy clothes, wear comfy socks, listen to music you love, bring a snack you love, bring a book you love… etc. Wearing layers is great because every once in a while, I’ll find that I feel overheated because of the turbulence and anxiety. Sometimes, just taking off an outer layer will help me feel less anxious. And bring a bottle of water and sip it throughout the flight. Sometimes, they won’t offer water until well into the flight. It’s always good to be prepared with your own. Recently I had terrible motion sickness on a plane. We went through a lot of “rough air” to quote the pilot! Let’s just say I lost it many times. (Of course it didn’t help that we were in the very last row, with no window.) I had been chewing on candied ginger and rubbing spearmint oil on my wrists(but maybe that’s not as good as peppermint?) Alas, they didn’t work. I was so glad to get off that plane, and did NOT want to get on the next one! I picked up a pack of Dramamine in the airport. Never taken it before, but it worked! I hate taking medications, but it was a lifesaver. lol. One more thing I think is a must bring for flying is gum. I don’t care for gum much, but find it’s very helpful to chew during ascending and descending so my ears don’t get all plugged up. Awesome tips! I have to pack extra hairbands…and a small first aid kit. How do you use the essential oils? You can put them on your wrist or on the bottoms of your feet. I usually do the bottoms of my feet. 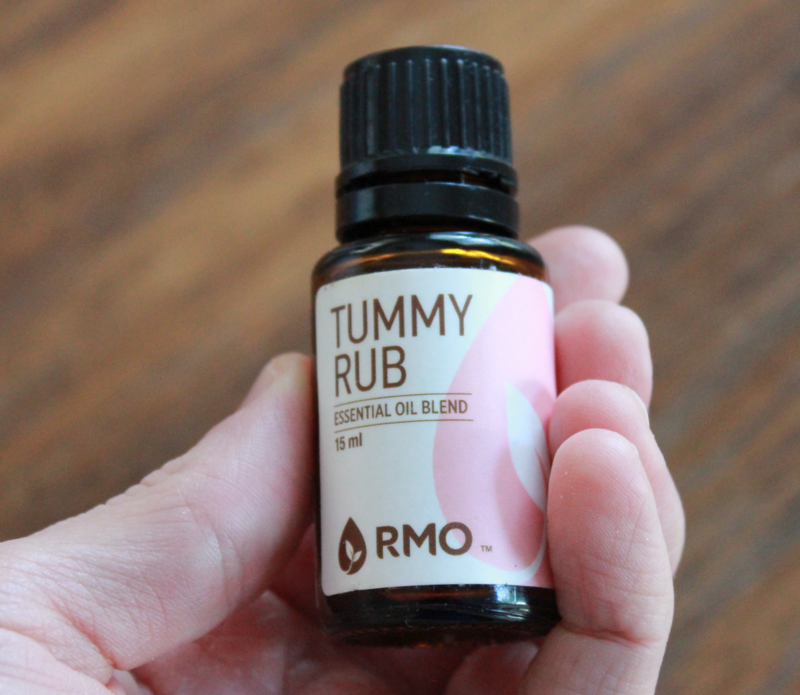 Some people mix them with a carrier oil, too (like coconut oil). I am also a lover of real books, but once you try traveling with a kindle, you probably won’t go back. I take mine everywhere, even though I prefer real books at home. I tried my iPad a few times and just couldn’t do it. I love, love, love real books! I always am both hungry and thirsty on an airplane, even if I just ate a big meal! Oh, and Altoids. I get motion sickness and these seem to help. How do you pack your essential oils in your carryon to get through security? You can put them in a separate bag — just like you would other bath & beauty products. This is a great list, Crystal. I hate packing for air travel, but this definitely helps. For me a “must have” item is my EarPlanes disposable earplugs that help with the extreme ear discomfort that comes from flying. Flights are a great time to read magazines, and you have the option if leaving them behind for the next person. Personally as a yarn crafter, I take at least one knit or crochet project. I make sure it’s something small like baby hats and booties, dishcloths, etc. This keeps my hobby from intruding into a neighbor’s space. I would add snacks to that list. One time I was late for my flight and missed lunch and due to a short layover was unable to get food for the next leg. 12 hours later I landed on the other side of the country nauseous and seriously hangry. Now I always pack a sandwich, nut bars, carrots, etc. They don’t take up much room but I feel 1000x better when I land! Oh, yes! A great tip! I’d love to know about your suitcase – my husband flies regularly for work but likes to gate check his bag. He’s looking for one with hard sides and good wheels, that can be carried on. What kind is yours and do you recommend it? After I read this post I read the 4 most important things you learned from wearing the same clothes for 4 days. I have to comment on both!! When I was much younger I decided to travel through Europe for 3 weeks on an Erail Pass. I took nothing but a backpack. I was in my early 20’s and not bothered at all by wearing the same outfit for 4 days. I slept on a train every night and cleaned up at in the station’s bathroom!! After 4 or 5 days, I threw the outfit in the train station trash. It made room in my backpack for souvenirs! I am still pretty good at packing my under the seat luggage these days! Thanks for all your tips they were great, and lots of them I also bring along – but am still yet to master packing light! Plus I also like to have all my important documents/ valuables and address book with me In case of an emergency or lost luggage…. I would like to know what weight your carry on ends up as most flights I travel have a 7kg carry on weight limit! I think it’s usually around 15 to 19 pounds, depending upon the trip. If I had a carry-on weight limit, I’d shuffle things around so that I was carrying more weight in my backpack and less weight in my carry-on. Unfortunately, that limit includes “hand luggage” ie backpack or hand bag. I do try and wear my heaviest shoes and coat if it is winter but still struggle to keep it under 7 kgs (15 pounds). Jenna – We travel a lot and live overseas (as American expats). We have gone through loads of luggage. The absolute best one we have found is Delsey. You can purchase last years model on line for less and the hard sides and the wheels are fabulous. We have been all over the world and it has not been treated gently – and still in great condition. We now have a full set x 2 and it’s the only luggage I will purchase, The carry on size works great for many trips too. Hope that helps. Great list, Crystal! One additional thing that I always bring is my travel adapter and converter as needed for destination…. Oh, and a copy of my passport too! OH yes!!! Thank you for mentioning that! I am going to be flying to a different country for almost 3 weeks and will be about 22 weeks pregnant at that time. Are there any traveling tips you might have for flying/traveling during pregnancy?? I always bring a pashmina shawl which can be used as a wrap when chilly or a beach/pool cover up. Also fold up ballet slippers to wear on the plane and in the hotel room, and my favorite herbal tea bags. Oh, and sunglasses! Thank you so much for this inspiring blog post. I am happy that I found your blog! I really like the trtl “pillow” for sleeping on planes. I have such a hard time sleeping in any upright position, and it holds my head up so I can sleep.